Unleashed is back at 245 Waverley Rd in Dartmouth, NS. Please check out our Facebook page to stay up to date. 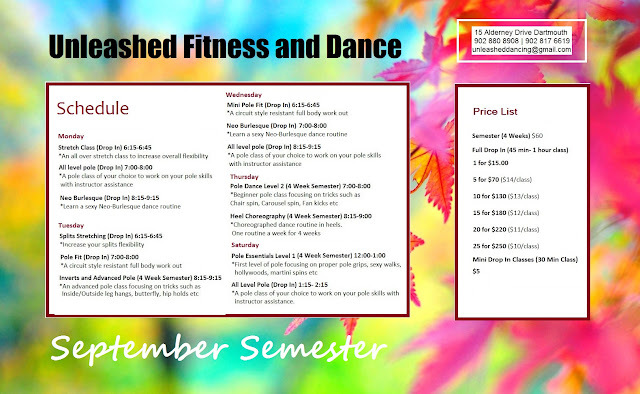 We offer tanning, esthetics, dance and fitness classes and more! Fall semester starts September 3rd! Just a few changes for May and June, basically Tuesday and Thursdays classes switched nights. Let us know if you have any questions or want to sign up for a class! The studio will be open regular hours on Thursday (24th), closed for Good Friday (25th), classes will resume on Saturday (26th), and then the studio will be closed again Sunday (27th) and Monday (28th) for Easter. For more information on our drop on classes please contact us at 902 880 8908 or 902 817 6619. MARCH SEMESTER AT UNLEASHED BEGINS MARCH 1st REGISTER NOW!